Put your portfolio to work for the land, people and wildlife of Africa. When you make a gift of appreciated securities you enjoy a double benefit: you receive a charitable tax deduction for the full fair market value and you pay no capital gains tax. Please contact AWF's stock broker or call (202) 939-3333. 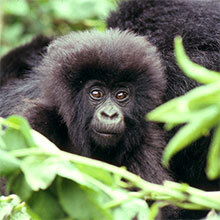 Help us continue to protect the wildlife and wild lands of Africa. Join our most dedicated partners in the fight to protect wildlife from endangerment and extinction. Renew your commitment to Africa’s majestic wildlife and wild lands. Make a gift in a loved one's or friend's name. Honor a friend or loved one with a donation to protect Africa’s wildlife. Give through payroll deductions via EarthShare. Enjoy the tax benefits of a donation of appreciated securities.